Amanda Martanovic heads the automobile subrogation division of the firm. Amanda has litigated subrogation cases in most of the jurisdictions throughout Ohio. She holds a CSRP (Certified Subrogation Recovery Professional) designation from the National Association of Subrogation Professionals. Amanda learned the nuances of subrogation from the ground floor up. She first joined RMI while studying at Cleveland Marshall College of Law. Her previous experience included working at the Cleveland Law Department. Upon graduation from law school, Amanda was a natural fit to the firm’s auto subrogation practice, and she expanded her case load to other subrogation areas. She has litigated cases involving collision, medical payments, under and uninsured claims, parental liability and coverage issues. Amanda holds an NASP Certified Subrogation Recovery Professional designation. The designation is awarded to subrogation industry professionals who have met stringent academic and experience requirements, followed by passing a comprehensive examination of multiple subrogation topics. 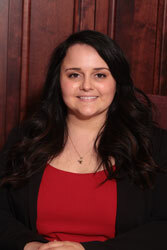 Promoted to manager of RMI's auto subrogation unit, she utlizes her skills and knowledge of all aspects of auto subrogation coordinating litigation of auto cases throughout Ohio. Amanda also supervises the auto division employees. Amanda's track record of success and years of experience in subrogation make her a valuable asset to the firm. Amanda has litigated cases in most of the jurisdictions throughout Ohio. Her experience includes representing insurers on auto collision, medical payments, under and uninsured claims, parental liability and coverage cases.